Yet another dual core smartphone from Intex is now spotted on official website, the Aqua i2+. The Aqua i2 plus comes with entry level specs which makes it a perfect rival for entry level dual core phones. It will compete / vs with Gionee Pioneer P2, Micromax Canvas A77 juice and Intex Aqua i4+ that was launched recently. It runs on Android 4.2 Jelly bean operating system. The Aqua i-2+ comes with a 5 inch capacitive touch screen having FWVGA resolution i.e 854 x 480 pixels. The phone packs a 5-megapixel fixed focus rear shooter with LED flash and 2-megapixel front camera. It gains the power from a 1.2 GHz Dual core processor based on MT6572 chip. It is dual Sim device with 3G support. The Intex Aqua i2 plus has 512MB of RAM and 4 GB of internal storage. Further you can expand the memory via inserting micro SD card up to 32GB. There is 1700 mAh battery to make the device alive. The battery offers 5.6 hours of talk time and up to 212 hr of standby time. It has 3G, 2G, WiFi b/g/n, Bluetooth, GPS / A-GPS and micro USB connectivity. It comes pre loaded with games like NOVA 3, Chennai Express etc. The price of the smartphone is not announced yet. 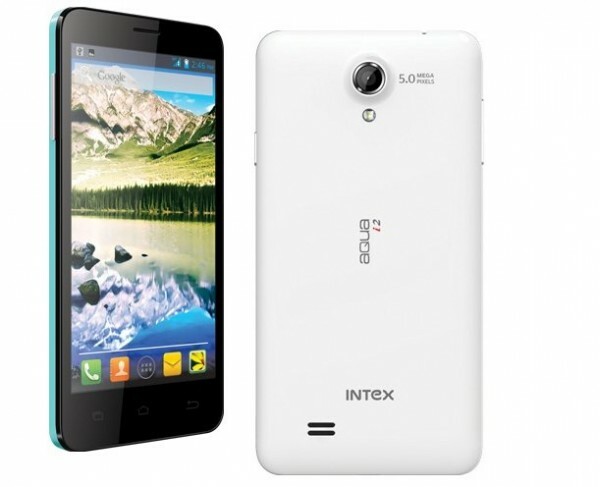 The Intex Aqua i2+ comes with white, black and green colors.